We’re currently on the lookout for outstanding Renderers and/or Solid Plasterers with a minimum of three years experience who would like to switch it up a bit and get into decorative finishes. If you have a great eye for detail, like creating beautiful finishes and are good with a hawk and trowel, then we want to hear from you! In return, we offer great rates, ongoing work, a friendly team and the opportunity to be creative and learn something new. Own transport and a construction white card is essential for this role. Contact Melanie on (03) 5264 7361 or send your details to melanie@renderitoz.com or 0401 727 576 and we’ll give you a call. 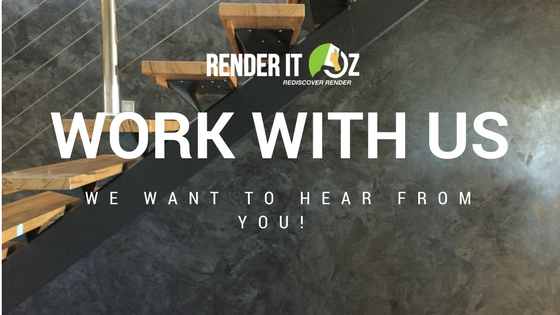 Based in Torquay, Victoria and servicing all of Melbourne and surrounds, Render It Oz aims to help you 'Rediscover Render'. Pricing and Inclusions for Tagines and Tadelakt retreat released!